What Is a Gas-Powered ATV for Kids? An All-Terrain Vehicle commonly called an ATV or quad in the United States and a four-wheeler (or three or six-wheeler) elsewhere, is a combustion engine motorbike designed to traverse a wide variety of terrain. The American National Standards Institute (ANSI) defines a gas-powered ATV as a vehicle that rides on low-pressure tires with handlebars for steering and equipped with a seat the operator straddles. While street-legal in many parts of the world, quads are not recognized as such within most of the United States, Canada, and Australia. While these vehicles can have engines as large as 1,000 cubic centimeters (61 cubic inches), it is far preferable for a kid’s ATV to have a much smaller engine. Recognizing the need for more child-friendly ATVs, manufacturers have engineered models specifically designed for kids and teens. Not only do these ATVs have smaller motors, they have bigger brakes (with easier hand controls on the handlebars) and other safety features to make riding safer for children. It’s never too early to educate youngsters on how to ride an ATV; thus many parents start their kids on “toy ATVs.” In fact, a child can ride this type of vehicle properly before learning to walk. A toy ATV (electric four-wheeler for kids) will teach a child how to steer, brake and make it go. More importantly, it will build a child’s confidence and awareness in a controlled environment. After children have mastered the basic skills of operation they can move to a starter ATV, most typically one with a 50 cc engine or 110cc ATV for kids. Most parents want the best for the children and certainly, there are “Cadillac” type ATVs available. These brands are well-built, safe and durable. Also, these manufacturers have years of experience and sold millions of models all around the world. Anyone who is interested in these brands will find a plethora of information from online blogs and owners who use their products. 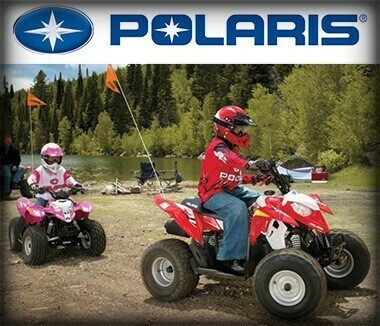 Currently, Polaris markets five models for “youth” riders, as described below. The models feature a parent-adjustable speed limiter, safety flag, helmet and instructional DVD. All prices listed are starting (without additional modifications and/or accessories) US Manufactured Suggested Retail Price (MSRP). RZR® 170 — Available colors are “Indy Red” and “Voodoo Blue.” Now available for riders 10 years older and above. Sportsman® 90 — Available color is “Sage Green.” Polaris specifically notes that this model is not for operators under the age of 10 and riders younger than 16 must be supervised by an adult. Outlaw® 90 — Available colors are “Voodoo Blue” and pink. Again, Polaris specifically notes that this model is not for operators under the age of 10 and riders younger than 16 must be supervised by an adult. Outlaw® 50 — Available colors are “Voodoo Blue” and pink. This model is intended for children age 6 or older with adult supervision. Phoenix® 200 — Available color is “Boardwalk Blue.” This is the deluxe Polaris model for youths, equipped with an air-cooled 200 cc engine and an automatic PVT transmission with forward, reverse and neutral gears. The Phoenix is a ride built for long travel comfort with a dual A-arm front suspension and a 6.5-inch rear suspension. Yamaha’s ATV is the Raptor. 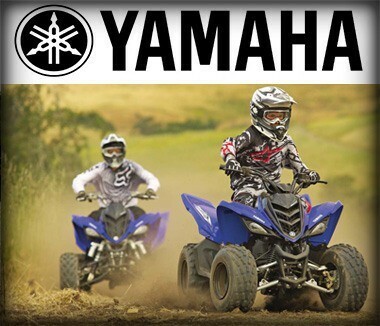 While most models have powerful engines and features intended for adults, Yamaha manufactures a version of the Raptor appropriate for youths. Raptor 90 — Available in both Team Yamaha blue/white and white with graphics kit, the 90 has an 88 cc, 2-valve air cooled engine with an electric starting system and a kick start back up. Chain driven with an automatic transmission, it has a plug-in for a capacitor discharge ignition (CDI) that restricts power for novice riders. TRX90X — Available in a red color, this model has an 86 cc, 4-stroke engine with a push-button electric starter and a clutchless automatic transmission. Recommended for riders 12 years of age and older. 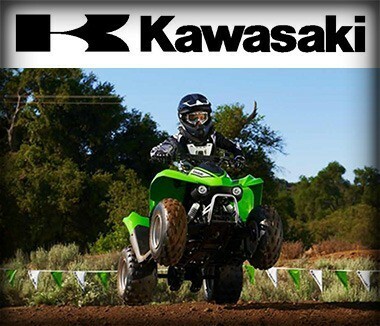 Of the three ATVs, Kawasaki manufactures, two may be considered appropriate for youths. Both are powered with air-cooled, 4-stroke single cylinder engines, carburetors, and chain drives. Both have steel frames, dual mechanical drum brakes, single A-arm front suspension with twin shock absorbers, solid state ignition. continuously variable automatic transmission and a 1.5-gallon fuel tank. KFX® 50 — With a curb weight of 240 lbs., the 50 has a seat height of 25 in, rear axle ground clearance of 3.4 in and 49.5 cc engine. KFX® 90 — With a curb weight of 262 lbs., the 90 has a seat height of 25.6 in, rear axle ground clearance of 4 in and 89 cc engine. If you as a parent are thunderstruck by sticker shock at contemplating the prices above, fret not. There are a number of quality ATVs available at a fraction of the cost with most of the same features of the “name” manufacturers. Remember that advertising and “brand recognition” are part of the price one pays for a high-end four-wheeler. However, smart shoppers can spend hundreds instead of thousands and still enjoy all the fun an ATV provides. Thanks to manufacturer promotions that include discounts for students, seniors, and military personnel, additional savings can be realized. The secret to cost competitive ATVs is the labor used for assembly. ATVs made in China utilize some of the lowest labor costs in the world. 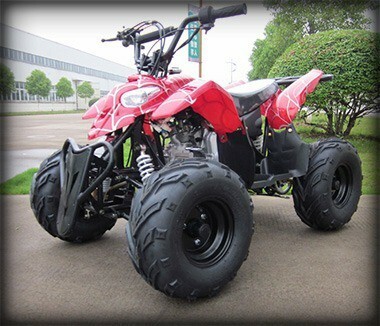 There are a number of Chinese ATV manufacturers and the quality of construction differs from one builder to another. Moreover, Chinese ATV quality is heavily dependent on the importing company’s quality control measures, no matter if the importer is based in North America, Europe or Oceania. Also, many cheap ATVs require basic final assembly (usually an hour or less using basic tools with instructions available on DVD), which also lowers the price to the consumer. Another factor contributing to the durability of an ATV is speed and power. The engine and frame of a slower ATV will be subjected to less stress than a more powerful model and hence will last longer. This simple fact of physics bodes well for the durability of ATVs designed for youths as they typically have smaller engines and are underpowered compared to much bigger models. Also to be considered is the availability of parts. Like other vehicles, ATVs are susceptible to breakdowns, particularly if maintenance is spotty or nonexistent or if the rider is aggressive and pushes the vehicle to the edge of its performance limits. When choosing a dealer, check for availability of spare parts and factory support. Avoid ATVs sold at flea markets. Where to Buy Youth Four-Wheeler Online? 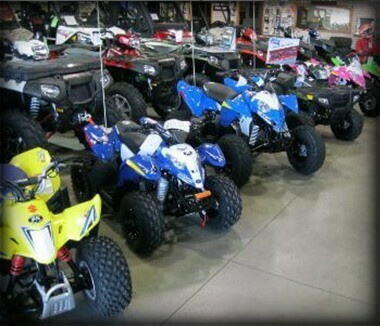 You can find a lot of ATV dealers online offering economy four-wheelers for kids (and adults as well). Mega Motor Madness, Superior Powersports, Killer Motorsports, Powersports Max, and many more. You will see that most of the ATVs provided by these companies have the same look but different model names. Let’s take a closer look at one of such companies – the leading one. sells a wide range of sports vehicles including mopeds, scooters, and ATVs with a full range of spare parts. To gauge the reaction of their customers (which is uniformly positive), see here. Interested consumers will find several entry-level ATVs with a choice of accessories that come with free shipping. Responsive customer support through live chats, email, and toll-free phone numbers is available for the customer’s convenience. Older children and teens will find the models listed below from Mega Motor Madness a fun ride with plenty of power. All have air-cooled, 110cc engines with automatic transmissions. Unless otherwise noted, all models feature front double a swing arm suspension and front drum/rear disc brakes. Choose from thirteen colors including striking hues such as burgundy, spider, camo and maple leaf as well as more traditional tones. Tarantula SKU: ATV001 — 6-inch wheels. Dirt Demon SKU: ATV003 — Has an automatic transmission with reverse gear, 7-inch wheels and working headlights. Thunder SKU: ATV033 — Equipped with 7-inch wheels and a rear rack. Dragon SKU: ATV055 — 7-inch wheels. Speedster SKU: ATV054 — 6-inch wheels. Avalanche SKU: ATV031 — 6-inch wheels. Shadow SKU: ATV032 — Stands on 7-inch wheels and accessorized with a rear rack. Tank SKU: ATV051 — With 7-inch wheels, this model features front hub/rear disc brakes. It should be apparent that a family won’t all be riding the same ATV model. For maximum enjoyment, choose an ATV based on the age and experience of the rider. The learning curve for an ATV is much less than say, a dirt bike. For the novice rider, four-wheelers are easier, more comfortable and safer. Your children can be expected to get on and immediately begin to ride with little difficulty. First, as your children will probably be using the ATV for trail riding, look for sports models as opposed to those designed for work or utility. High-performance motocross models or those intended for farm work won’t be the best fit for family recreational pursuits. Many parents also prefer that their children ride ATVs with adult supervisory controls that include throttle limiters (limits speed), exhaust restrictors (reduces engine power) and remote shut-off switches. 70 cc to 125 cc ATV — children for the ages of 12 to 15. These suggestions above are guidelines. A mature 10-year-old with ATV riding experience will likely find a 70 cc ATV boring and small. Nonetheless, it’s a good rule of thumb to start too small rather than too big. Beginning riders should start with ATVs that have single speed automatic transmissions. The novice can easily control power and an automatic clutch reduces chances of “popping the clutch,” which can cause a rear to overturn. Carrier racks are also not suitable for ATVs used by young children; the weight of the cargo can shift the balance of gravity of an ATV and reduce stability as well as block lines of sight. Remember that the biggest difference between three wheelers and four wheelers is stability. This is why the sale of new three-wheelers was outlawed several years ago. Three wheelers are more prone to side overturns. While available used or from resale dealers, do NOT purchase them for your children, particularly for those who have no experience operating ATVs. Advance features and accessories can significantly add to the cost of an ATV. Higher priced models that include options such as independent rear suspension, power steering, and manual clutches are not meant for beginners. Also remember that as a novice, your child is bound to have a crash or two when first starting out. Save the big bucks for a higher performance model after your child has mastered the basics of ATV riding. As with any pastime, it’s better to start small and upgrade to a larger engine as the rider gains experience and technique. Parents should measure their child’s physical and emotional development when choosing a suitable ATV for their use. Physical development entails the size and strength of a child as well as his or her visual perception and coordination. Emotional development or mental maturity encompasses discipline, reasoning, focus and decision-making capabilities. As parents may overestimate their child’s skills and aptitudes, it may be best to seek a more objective evaluation from another adult acquainted with the child. Make the following observations of your child on an ATV. Ask your child to stand on the footrests of an ATV and grasp the handlebars. It is recommended that there be 3 inches of clearance between the ATV seat and the crotch of the youth’s pants. Now direct your child to move the handlebars completely to both the right and left. 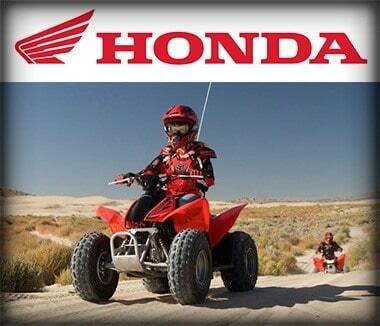 Is your child capable of moving the handlebars across the entire range of motion allowed by the ATV? Can your child use the throttle with one hand and compress the break with the other? How well does your child shift weight from side to side and from front to back to maintain balance? Note that riding a bike safely translates well to the safe operation of an ATV. Suspension System — The most advanced suspension technology available uses coil springs with shock absorbers for optimal traction and control that make for smooth driving. On the other hand, ATVs that use only balloon tires for suspension are susceptible to a rough, bouncing ride that can pitch sideways at high speeds. Braking Systems — Some ATVs have only rear brakes or use front and rear brakes with separate, independent controls. Novice riders need to learn how to operate an ATV’s braking system correctly in order to maintain control in case sudden braking is needed. Foot Rests — Rear fenders and footrests should be engineered to prevent a rider’s foot from being caught under a rear wheel. Hot Engine Parts — Hot engine components such as mufflers or exhausts should be located or safeguarded to prevent burns. A well designed ATV will prevent the buildup of dry, flammable debris near hot exhausts to minimize the chance of fire. Don’t overlook proper gear when riding an ATV. The importance of wearing an ATV helmet has been noted; it should have a snug and secure fit. Look for the American National Standards Institute (ANSI) label or US Department of Transportation (DOT), indicating that the helmet complies with national test specifications. On forest trails, ANSI Z78.1 standard for eye protection is required if the rider’s helmet lacks a face shield. Wear above-ankle shoes or boots with rugged non-slip heels and soles, gloves, long pants and long-sleeved shirts. Goggles and knee and shoulder pads are also sensible safety precautions. 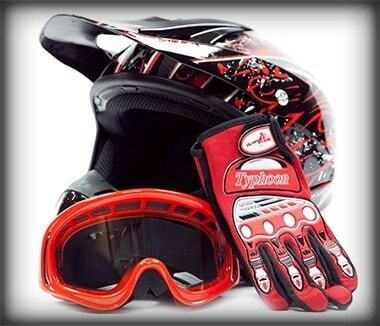 Proper gear also includes ATV safety features such as lights, reflectors, and flags for increased visibility. Note that ATV tires are designed for off-road, not highway, use. ATV tires have treads that aggressively grip the road surface, which increase the chances of rollover and loss of control on paved roads. The ATV Safety Institute offers online courses for adults, teens, and children: https://cbt.svia.org/ To find an ATV RiderCourse® nearest you, call toll free 800-887-2887. Offical ATV Safety Certification from ATVcourse.com. The Canada Safety Council offers a separate rider’s course for children under the age of 14. Find out more here. Most US states and Canadian provinces have specific laws and regulations that address ATV operation and ridership by youths. Essentially, whenever your child rides an ATV off one’s private property, he or she is subject to legal requirements. Many US states have websites offering detailed legal and safety information for ATV riders and operators. Another valuable resource is the National Council of State Legislatures, which lists ATV safety laws by state here. Remember the 3 Es of ATV safety: Engineering, Education, and Enforcement. Operating a safe vehicle, applying knowledge and compliance with the use of personal protective gear will make that family outing on the trails more enjoyable for all. Besides safety gear there is a wide variety of ATV accessories available, ranging from practical to whimsical, that will enhance the four-wheeler experience of youthful riders. Many teens choose to individualize their ride with decals, handle cushions and brush guards. More useful items include extra gas tanks, tire changing kits and portable air compressors (or a can or two of pressurized puncture sealant), winches and toolkits. If your older child is a truly intrepid rider, he may want to attach a snow plow to his ATV for riding in inclement weather. ATV dealers and many companies offer a line of accessories that make riding ATV safer and more enjoyable. For example, some parents may want their child to have the comprehensive protection that body armor offers. It comes equipped with a back protector, shoulder cups, elbow cups, forearm protectors and chest foam. All attached to a durable, lightweight mesh shirt made from pliant Lycra fabric. Enclosed by a full zipper front and a wide elastic waist belt with Velcro adjustment, it also includes adjustable straps throughout the arms and shoulders and removable spine armor with tail protector. It’s made from high impact, injection molded plastic and can be worn alone or under a jacket. Beyond safety considerations, helmets, goggles, and gloves are also fashionable statements that complement any rider’s personality. Mega Motor Madness stocks a number of competitively priced, DOT-approved helmets, goggles and gloves for youths that come with free shipping to qualified areas and no sales tax (except for the state of Georgia). Depending on what part of the world you live, there may be a period of a few months during the year when the family’s ATVs require storage. Even during riding season, it’s a good idea to protect your ATV with a tarp or similar waterproof cloth (but not plastic; see below) if a garage or storage building is unavailable. For longer periods of dormancy, these recommendations will help extend the service life of your ATV. Drain or Preserve Fuel — Gasoline deteriorates over time; if the owner decides to put up the ATV for the winter, drain the fuel tank, fuel lines and carburetors or add a fuel stabilizer to preserve gas. Note that empty gas tanks are susceptible to rust so fuel stabilizers may be a better option in humid climates. Remove, Clean and Recharge the Battery — Without charging, a battery loses its power over time. Remove the battery, check the water level (if applicable; refill with distilled water if the level is low) and clean the terminals and battery housing with a solution of water and baking soda. Recharge the battery every month or so with a slow-charger or battery tender. Replace Oil and Filter and Lubricate Pistons — Also, if storage extends for several months, remove the spark plugs and apply a tablespoon of motor oil to each cylinder and rotate the motor a few revolutions without starting it. Replace spark plugs.
) into the exhaust pipe to inhibit rust and then seal the opening to prevent the nesting of insects or small animals. Tires — Inflate the tires to the limits of the manufacturer’s specifications, then prop up the ATV on jack stands or blocks to relieve stress on the quad’s suspension system. Place the stands just inside the swing arm and the A-arms. See that the ATV is secure and won’t tip over. Unless the ground freezes, it’s not necessary to have the tires completely off the ground. Using wood blocks, rubber or plastic (a Frisbee® has been suggested) as an insulator between the tire and ground is acceptable if it’s not feasible to lift the tires away from the ground. Covering the ATV — Store the quad in the garage or covered area that doesn’t get too cold in winter. When covering the ATV, use a material other than plastic. Plastic retains moisture which causes rust on metal parts as well as encouraging the formation of mold and mildew. This article has made the previous mention of ATV safety courses; these educational regimens will teach novices the proper techniques of operating a quad safely. It was also noted above that riding an ATV uses many of the same skills as riding a bike, and if your child feels comfortable pedaling a bicycle he or she will probably feel at ease operating an ATV. That being said, there are terrains such as deep sand, mud, and snow which can be a challenge to traverse. A few simple pointers can help overcome these barriers. Reduce Tire Air Pressure – If your child is riding through deep sand or snow, deflate the tires to increase tread’s footprint. The drier the sand, the lower a tire’s air pressure should be. This spreads the ATV’s weight across a larger area and increases traction. It also creates greater rotation friction at speed. Note that this will reduce ground clearance so take care not to “high center” the quad. Remember that high centering is also a possibility should your child drive in deep ruts. If the ATV becomes stuck in deep sand, reduce the tire’s air pressure to as low as 8 psi but once free immediately re-inflate the tires or else the rims could become damaged. Be aware that the amount of tire air pressure should vary depending upon the relative distance above sea level. Once you and your child arrive at your riding destination, check and if necessary adjust the tire’s air pressure before journeying down the trail. The goal is to float across the top of the sand rather than sinking into it; thus it is important that all four tires have approximately the same psi level. Uneven tire pressure causes an ATV to “drift” while moving forward and increases the chances of rollover and wrecks, particularly over rough, uneven terrain. Driving in Mud — Power the ATV at a steady and constant pace without spinning the tires. Speed up somewhat when going through deep, boggy areas. Should the tires begin spinning, turn the front wheels at an angle while slightly slowing down. This helps the tires to regain traction. Snow — Educate your child about the differences between “hard” and “soft” snow. Hard snow is firmer but more slippery and can be as slick as ice. This is particularly true if the snow melts somewhat, turns slushy and refreezes. Suffice to say that hard snow is more difficult to drive in than soft snow. Avoid steep inclines. As mentioned earlier, virtually every state and province has legal restrictions that apply to ATV operators and riders under the age of 18 (and in most cases adults as well). It should be pointed out that California, known for state laws and local ordinances that stretch well beyond the scope usually found in other parts of the US, strictly regulates vehicle emissions including those of ATVs. In 1998 the California Air Resources Board (CARB) — the state’s “clean air agency” — approved amendments to off-highway recreational vehicle (OHV) regulations directed specifically at ATVs. OHV registration is based on compliance with California’s exhaust emissions standards. Emission compliant ATVs are eligible for OHV Green Sticker registration and can be operated throughout the year; non-compliant ATVs receive Red Sticker registration and are subject to usage restrictions. In brief, if an ATV meets the CARB standard, it’s legal in all 50 states. Currently, a patchwork of regulations across the United States and Canada govern the operation of ATVs by youths. These standards address safety equipment requirements, operator licensing, the number of passengers allowed and the minimum age of the driver. The National Council of State Legislatures updated a pdf in January 2014 that details various state regulations for highway and road use, crossings, licensing, speed, public land use, and safety/age requirements. 18 states require ATV operators to use a combination of standard safety equipment to operate an ATV on public lands; the equipment most commonly required is a helmet (13 states); in eight of the 18 states, the requirements are applicable only to riders under a certain age. 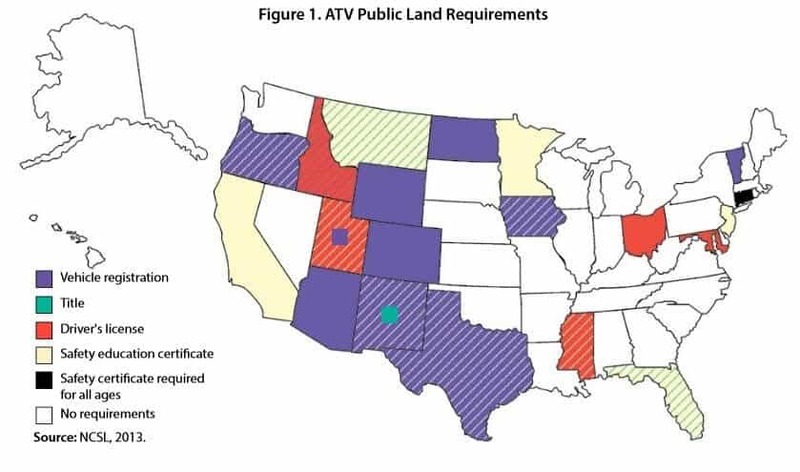 At least 19 states grant local municipalities or governmental agencies the power to regulate ATV use on public lands. 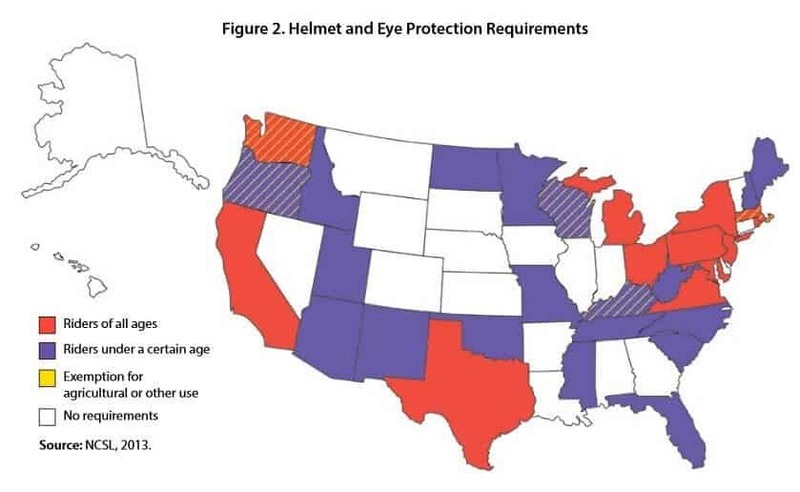 31 states require ATV riders to wear helmets and eye protection; in 20 of these states, a DOT-approved helmet is required. 33 states require ATVs to be registered and 13 states require a driver’s license to operate an ATV. 19 states regulate or prohibit ATV passengers but in 14 of these states, these laws only apply if the ATV was not designed to carry a passenger. Wherever you live in North America, there is a high likelihood that ATV ridership in your local area is regulated to some degree. Riding ATVs is great fun and recreation for all ages. It’s an activity that especially appeals to youthful riders and is appropriate for family outings. To get the most out of the sport, make sure to choose age and skill-level-appropriate quads for the rider, no matter what their age might be. Remember safety above all when riding and know the laws and regulations that apply to ATV riders in your local area. Proper maintenance and storage is also key to the longevity and performance of your quad. In recent years ATVs have proven more popular than dirt bikes, dune buggies or scooters. Their versatility and utility are unmatched; they can easily go places to where jeeps or trucks could never consider traveling. And while it may be more comfortable to ride ATVs in spring and summer, they are an ideal all-season and all-weather vehicle. As the name indicates, ATVs tackle all sorts of terrain from dirt to rock to mud and sand to snow into a swamp. When considering a family vacation, remember that in the US there are destinations that cater to ATV riders. For example, in Colorado, there are state parks with extensive networks of ATV trails — State Forest State Park in Walden has 75 miles of 4WD trails and Vega State Park in western Colorado has hundreds of miles of 4WD trails that run throughout adjacent Grand Mesa National Forest. Another alluring location is Ocala National Forest in Florida with almost 300 miles of ATV and 4WD trails. These facilities also provide specially equipped campgrounds that accommodate ATVs and their riders. So why are you staying home? Good times, great fun and adventure await! See you on the trail!